You won't find a more effective sweetener than stevia -- it has 30 times the sweetening power of sugar -- but when you cook with it, you have to substitute for more than sweetness. Sugar adds color, moisture, caramelization, aroma and volume to food, so you have to use stevia in conjunction with a thickener or bulk ingredient. You get the most from stevia when you process the dried leaves yourself into a form suited for the application. Ground stevia works well in baked goods, stevia extract provides a boost to glazes, and stevia syrup works as a finishing ingredient. Rinse the stevia leaves in cold water and lay them flat on paper towels. Pat the moisture from the leaves and let them sit out for a few minutes. Break off any stems. Grind the dried stevia leaves to powder using a mortar and pestle or spice grinder. Scale, or portion, out the dry ingredients -- except for sugar -- for the recipe. Portion 1 tablespoon of ground stevia for every cup of sugar called for in the recipe. Scale out the wet ingredients for the baked good and add an extra 1/3 cup of the primary liquid for every tablespoon of stevia used. For example, if you're making a hot-milk sponge cake -- which calls for 2 cups of sugar -- you would add an extra 2/3 cup of milk because you are using 2 tablespoons of ground stevia to replace the 2 cups of sugar. Mix the batter and examine the consistency. If the batter is too loose from the additional liquid or bulk ingredient, add flour, a teaspoon at a time, until it stiffens to the desired consistency. Bake the baked good at a temperature up to 400 degrees Fahrenheit. Rinse the dried leaves in cold water and pat them dry with paper towels. Break the stems off and crush the leaves in your hand. Put the crushed leaves in a glass jar. Cover the stevia with vodka and seal the jar. Keep the jar in a cupboard for two days. Strain the vodka through a mesh sieve lined with cheesecloth and into a saucepan. Reduce the extract on the stove over low heat until syrupy, about 30 minutes. Transfer the extract to a dark bottle that has a dropper; you're going to use stevia extract by the drop. Keep the extract in a dark pantry or cupboard until you're ready to use it. Prepare the glaze, dessert sauce, fruit sauce or other liquid-based sweetened dish until the point when you would add the sugar. Substitute 2 drops of extract per teaspoon of sugar; substitute 6 drops of extract per tablespoon of sugar; substitute 1/4 teaspoon of extract per 1/4 cup of sugar; substitute 1/3 teaspoon of extract per 1/3 cup of sugar; substitute 1/2 teaspoon of extract for 1/2 cup sugar; substitute 1 teaspoon of extract for 1 cup of sugar. Mix the glaze or sauce and heat it to 180 F in a saucepan. Add 1 tablespoon of powdered agar for every 2 cups of sauce. Stir to incorporate the agar and remove the saucepan from the heat. The glaze or sauce will thicken when it cools to 100 F.
Rinse the stevia and remove the stems. Pat the leaves dry and crush them by hand into a food container or jar. Use 1/4 cup of crushed stevia leaves for 1 cup of simple syrup. 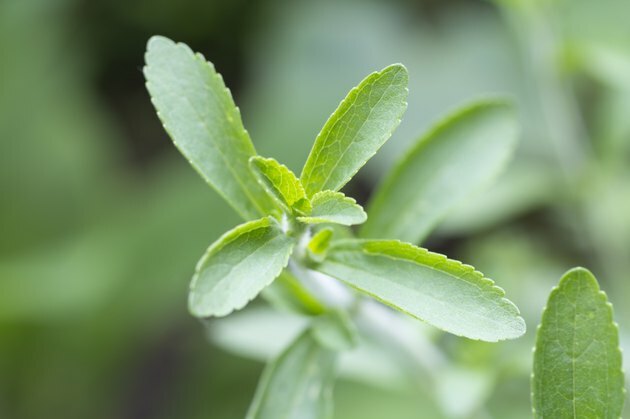 Cover the stevia leaves with 1 cup of tepid water. Steep the leaves at room temperature for 24 hours. Strain the syrup through a sieve lined with cheesecloth. Add the stevia syrup to taste to drinks, sauces, glazes or any other liquid that needs sweetening at the finish. You can find stevia leaves and agar at health-food stores and some supermarkets. Stevia extract and simple syrup keeps for 30 days. Store extract in a dark place, such as a cupboard, and store syrup in the refrigerator.